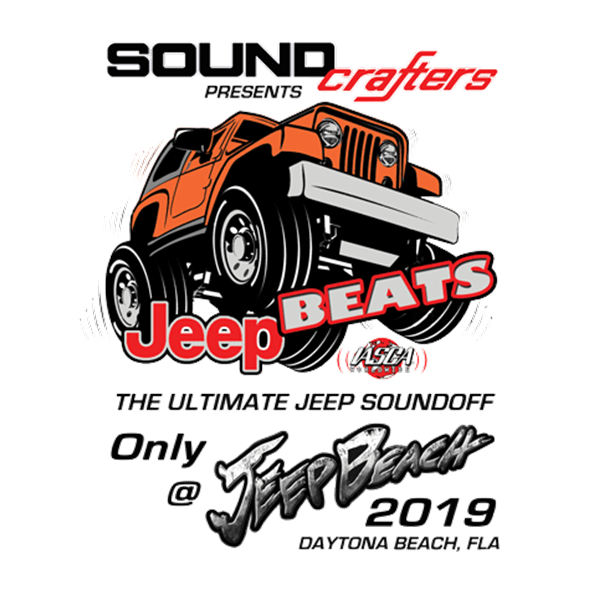 On Monday night, during Jeep Beach 2019, the International Auto Sound Challenge Association (IASCA) and Soundcrafters, Daytona’s Car Audio Powerhouse, will conduct the first ever Jeep Soundoff Competition at the Daytona Stadium on LPGA Boulevard. Three separate events will take place. Sound Competition Note: Please read the full description below before purchasing. Jeep Beats: Bronze, Silver and Gold medals will be awarded to the winners in each class. Jeep Beats is a competition of the participating Jeep’s sound system. Due to the uniqueness of the Jeep environment as it relates to sound, three classifications were created to make judging fair and consistent. The classifications are: HARD TOP – SOFT TOP and OPEN. Points are scored for: Sound Quality, Tonal Accuracy, System Safety and SPL (Sound Pressure Level). Judging performed by IASCA Certified Judges. Tonal Accuracy Judging includes the evaluation of all frequency ranges from low to high frequencies across the complete audio spectrum and their ability to be reproduced accurately. Sound Quality Judging includes the overall quality of the sound and system linearity, which is the ability to achieve a balanced sound at low volume, moderate volume and high volume, respectively. System Safety Judging ensures that the system is properly fused and protected, that the equipment is securely mounted, that the wiring meets industry standards for its gauge in its application, and the systems cosmetics are such that make it esthetically pleasant and unobtrusive. SPL is an acronym for Sound Pressure Level. IASCA judges use a meter to identify how loud the system can play. JeepGlo: Bronze, Silver and Gold medals will be awarded to the winners in each class. JeepGlo is a competition that evaluates the Jeep’s auxiliary accent lighting (non-factory) in both interior and exterior schemes. The use of any type of light source to enhance esthetic appeal or highlight a system or feature of the Jeep is considered. Also, the overall safety and integrity of the installation are considered while judging. Classifications are structured as INTERIOR – EXTERIOR and BEST OF SHOW. Jeep Sound Showoff: THIS IS AN EXHIBITION, NOT A COMPETITION. There will be a designated area that allows for Jeep Sound enthusiasts that have extraordinary sound systems and the desire to broadcast sound at higher than normal volume levels. These participants will have the opportunity, in a pre-structured arrangement, to play a complete tune of their choice (NO EXPLICIT LYRICS) at the most extreme level that they may choose. The JEEP SOUND SHOWOFFS will, one by one in succession, play a tune (no more than 5 minutes long) down the lineup. When the lineup is completed, the first Jeep starts again and after 5 minutes, the next Jeep gets to kick it again, and again as time permits. See the Jeep Beats Rules for this competition here. See the Jeep Beats Score Sheet for this competition here. See the JeepGlo Score Sheet for this competition here. Jeep Beach is the largest Jeep only event in the Southeast USA. 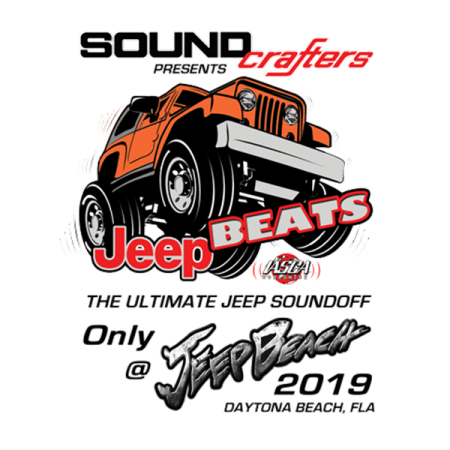 Over 5 days of fun in the sun with thousands of your closest Jeep friends, Jeep Beach attracts Jeepers and Jeep Industry Vendors from all over the USA, Canada, and even overseas. Jeep Beach is held each April in Daytona Beach, Florida to raise much needed funds for worthwhile local and national charities.